This Dual Monitor Floor Stand Will Catch the Eye of Passerby's in Any Tradeshow Environment! This Display is Ready to Ship! This Dual Monitor Floor Stand is Durable! Heavy duty stand holds two televisions 22"-60" in size & weighing up to 176 lbs. 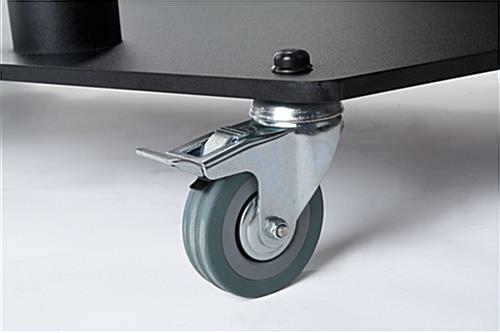 (4) Locking caster wheels make for easy mobility. Durable construction is ideal for use in high traffic areas such as businesses or for trade shows. Mounting hardware included for most flat screens. Customer is responsible if special screws are needed. This black and chrome dual monitor floor stand, also known as an lcd display mount, is VESA compatible. These flat panel displays are portable and can hold multiple screens. This heavy duty dual monitor floor stand is great for trade shows or commercial use! These lcd tv racks allow for maximum advertising capability on screens ranging from 22"-60" in size. This dual monitor floor stand is an eye catcher at tradeshows. These heavy duty lcd mounts are easy to transport from one area to the next with the heavy duty locking caster wheels. This dual monitor floor stand has a tilting bracket for angling the screen upwards or downwards. These multiple flat panel mounts have double chrome finish poles to securely hold screens in place. This mobile tv rack is ideal for tradeshows to endure high traffic. 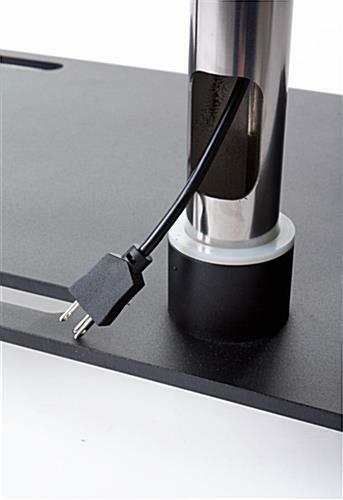 The black powder coated steel base can stand up to years of use. This flat panel display includes television mounting hardware. Amazing product. Sturdy, good material, professional looking, and functional.